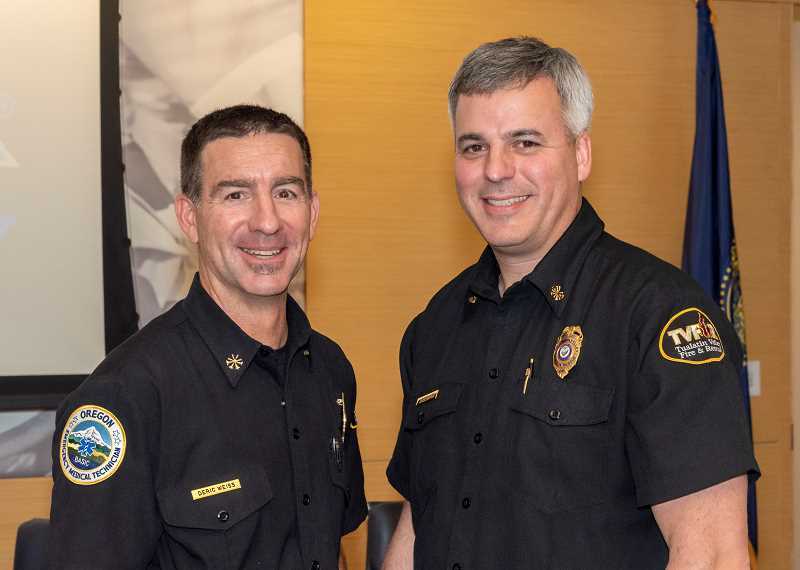 After an extensive process, Tualatin Valley Fire & Rescue's Board of Directors selected Assistant Chief Deric Weiss to replace Fire Chief Mike Duyck when he retires June 30, 2019. Weiss was among several internal candidates who spent the past two months participating in assessment activities, listening sessions and interviews with elected officials, union representatives, executive staff and community leaders. TVFR provices services to West Linn. "The most important thing a fire district board will do is choose a fire chief," President Clark Balfour said. "I've personally been on TVFR's board for more than two decades, and this is only the second time we've conducted this process. We believe it is critical that our next fire chief continues the stable leadership, sound business practices and community-focused service that Chief Duyck has maintained over the past eight years. During the selection process, we were so impressed that we had so many high-caliber, qualified leaders in our ranks." Chief Weiss has held multiple ranks at TVFR since first becoming a firefighter 24 years ago including lieutenant, captain, battalion chief, division chief and assistant chief. Most recently, Chief Weiss has overseen all of the fire district's emergency operations which include 27 fire stations, two operating centers, three specialty teams (water rescue, hazardous materials and technical rescue) and 432 firefighters and paramedics. Chief Duyck is pleased by the Board's decision. "Chief Weiss and the other candidates were put to the test these past months. I'm proud to say that they all have the skills, heart and tenacity to be a fire chief," Duyck said. "Most importantly, they share a fierce commitment to the people we're sworn to serve. Chief Weiss will undoubtedly provide strong leadership and will work hard to improve TVF&R." Chief Weiss has an associate degree in fire science and is in the process of obtaining his bachelor's degree. He holds numerous certifications in emergency operations and is an Oregon-certified Emergency Medical Technician. Chief Weiss has been involved in many local and statewide fire service initiatives including emergency communications, dispatch, hazardous materials response, intergovernmental affairs and interoperability. Chief Weiss serves as a member of the Board of Directors for the Oregon Fire Chief's Association. Over the next six months, Chief Weiss will work alongside Chief Duyck to ensure a smooth transition. They will focus on fire district policy, funding, deployment and the organization's strategic goals. Both chiefs will also be visiting with city councils and community groups prior to Chief Duyck's departure.